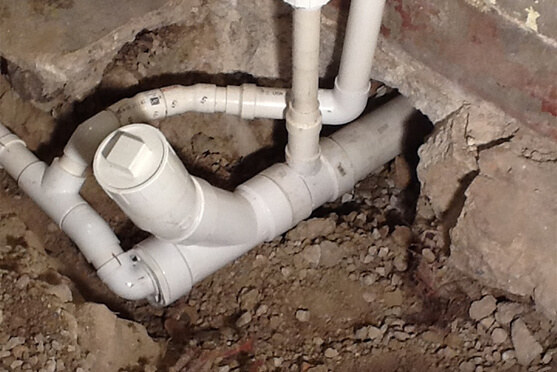 RapidPlumbing technician performing sewer and drain services. Rapid Plumbing provides expert sewer and drain cleaning, repair, replacement, and clog removal to our customers in San Fernando Valley and surrounding areas. From small hydro-jetting jobs to line replacement, we do it all. Our technicians use their years of experience to assure that you are fully satisfied. We use high-pressure hydro jetting to clean out the clogs in drains and sewers. This includes commercial hydro-jet drain cleaning technology used for both our commercial and residential customers. Our process utilizes high-pressure water at 4000 psi to efficiently cut tree roots and emulsify grease. Using an electronic leak detector, we can locate underground problems quickly. Slab breakage and repairs are kept to a minimum and that means a less costly job.